SPA Executive in Residence, Betsy Fischer Martin interviews authors Amie Parnes and Jonathan Allen about their new book, Shattered. It is not easy to understand what exactly led to the defeat of Hillary Clinton against Donald Trump in the 2016 Presidential Election, but journalists Amie Parnes and Jonathan Allen give some compelling explanations in their recent best-selling book, Shattered: Inside Hillary Clinton's Doomed Campaign. 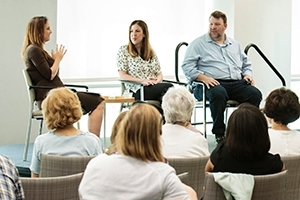 The authors visited AU's School of Public Affairs on June 23, hosted by SPA's Executive-in-Residence Betsy Fischer Martin, to talk about their findings on Clinton's campaign and the current state of American politics. Parnes and Allen, who also published HRC: State Secrets and the Rebirth of Hillary Clinton, argue that there was a divide within the campaign between a more experienced and persuasion-focused faction and a less experienced set that was more reliant on statistics. "From state offices, there were demands to the headquarters asking for volunteers, for yard-signs, for literature, but the analytics side of the campaign thought it was unnecessary to spend that money," said Allen. "They argued it was difficult, in the last months of the campaign, to win over voters who didn't like Clinton." The authors, who covered the Clinton campaign through 2016, also reported on indications throughout the campaign of a potential defeat, including the rise of populism movements like Brexit, which former President Bill Clinton recognized as a potential threat to the campaign. There was the primary election as well, in which U.S. Sen. Bernie Sanders (D-Vt.) at times launched criticisms similar to those that Trump would later make. "It's one thing for two people in a party to disagree on a policy issue, but when you start talking about how corrupt someone is, that just plays into the other side's hands," said Allen. Still, there was a general expectation of a Clinton win come November. Both Parnes and Allen admit that on Election Day they were "pretty sure" Clinton would be elected president. "We went into that night thinking she would win," Parnes said. "During our reporting, there were moments that we knew that there were severe problems in the campaign, but did not think they would ultimately result in her losing." Asked by incoming SPA graduate students about the biggest mistake the Clinton campaign made, the authors described missteps, difficulties within the campaign leadership, and too many decision-makers. Parnes and Allen also said Clinton's desire to prevent press coverage about campaign shakeups, prevented any deep changes in the Brooklyn-based headquarters team. Even so, the authors also highlighted the fact that Clinton had numerous successes, including her victory in three televised debates, as well as the way she was able to secure the Primary win. When asked by moderator Betsy Fisher Martin about the future of the Democratic Party, both Parnes and Allen agreed that the key to winning elections will not be about ideology as much as it will be about the candidates.